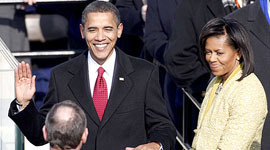 As Barack Obama prepares to be sworn in as the 44th president of the United States, a new 17-nation poll has revealed that as many as 63 per cent of Indians see US relationship with the rest of the world increasing under his presidency. The 17-nation poll conducted for the BBC World Service, a media release said, finds widespread and growing optimism that Obama’s presidency will lead to improved relations between the US and the rest of the world. The poll also shows people around the world are looking to Obama to put highest priority on dealing with the current global financial crisis. Although Indians agree with most people in other parts of the world that the US should make dealing with the global financial crisis a top priority, the number holding this view is less than one-half and lower than all other countries polled. According to the poll, Indians believe the US should put emphasis on dealing with the global financial crisis (47 per cent top priority, 21 per cent important) and improving America’s relationship with their country (42 per cent top priority, 22 per cent important). As many as 35 per cent of Indians say addressing climate change should receive top priority from the US, while 33 per cent believe it should be important, the release said. Indians have seen a large increase in optimism that US relations with the rest of the world will improve under an Obama administration since last summer, along with most other countries polled, the poll showed. Overall in 15 of the 17 countries polled, majorities think that the election of Barack Obama will lead to improved ties with the rest of the world. On average 67 per cent express this upbeat view, while 19 per cent think it will stay the same and just five percent that the relations will worsen. This is up sharply – by 21 points among tracking countries – from polling done for the BBC World Service six months ago, before Obama was elected. Asked to rate six possible priorities for the Obama Administration, the top priority in all 17 countries polled was the global financial crisis. On average, 72 per cent said that it should be a top priority. This was followed by withdrawing US troops from Iraq – with 50 per cent saying this should be a top priority – then addressing climate change (46 per cent), improving America’s relationship with the respondent’s country (46 per cent), brokering peace between Israel and the Palestinians (43 per cent), and supporting Afghanistan government (29 per cent). As many as 17,356 adult citizens across 17 countries were interviewed in this survey conducted for the BBC World Service by the international polling firm GlobeScan together with the Program on International Policy Attitudes (PIPA) at the University of Maryland. The polls were conducted between November 24, 2008 and January 5, 2009.